I wrote in a previous post about going paperless. I wanted to give an update. On the writing side I tried the Pogo stylus but after some time decided I didn’t like it. It’s too thin to hold and thus there is not a pen feel to it and the top feels like a piece of sponge cut off and glued on. Also I didn’t like how it felt to write on the screen, it didn’t really glide across the screen as I had imagined and it was more forced across the screen. It worked fine but if I wanted to stay using the iPad as my notepad I wanted to find a nicer writing experience. I did a little research and found the Bamboo. I have been using the Bamboo a few weeks now and really like it. It is the same size as a pen with some weight so the feel of it is much better. Excellent build quality for a simple tool and the silicon type top means it very nicely glides across the screen and much easier than the Pogo stylus. I really am enjoying using it. I have a number of notepads for different projects open within the app Penultimate and its working really well. Referring back is easy. Not carrying paper is great and the only thing I am very careful about is ensuring my iPad always has plenty of battery. The other thing that has changed is the newspaper app. I started with the Wall Street Journal, moved to the Financial Times and am now with The Telegraph. The Telegraph is the cheapest of the three, I prefer it in its usability and content. It’s a pity you can’t share articles easily but other than that I really like. Other papers and magazines need to catch-up and have their content properly formated for these iPad type of devices and not just the scanned in type replication of the physical format that most seem to do. GoodReader is another app I am using more also. Especially with the stylus GoodReader allows me to write straight onto the PDFs I am reading or add typed comments. Great for reading reports and white papers and no more printing. In the past I would print these items to bring with me especially when travelling but now its all on the iPad. I am still struggling with a couple of things like keeping and marking up links. Yes there are plenty of apps out there that do this but so far havent settled on anything….looking at investing some time in Evernote again to see if it works as lots of good feedback on it but still trying to perfect the apps list. I have now got in the habit of bringing the iPad everywhere. It’s so much easier to carry around than a laptop to meetings, easier to use and less invasive. There has actually been a somewhat unforeseen side effect. The last paper magazine I submit to is the F1 mag which I have blogged about before. Its delivered every month to my door. I don’t pick it up. I am so used to everything in the iPad and using it I seem to have abandoned paper. I have just become completely at home with using the iPad for everything where it once was paper. Multi-tasking now on the iPad is just second nature. Hand written notes, typing an email, researching a piece on the web, updating our office sharepoint, reading the newspaper, reading a book, watching a video, listening to the radio, watching a movie, remote desktop to a server, updating Twitter or Facebook, writing a blog… the list goes on and on. I think if I can find a couple of more apps to help me on a couple of points where I am poor and for me it might become the perfect tool. After many false starts in the past with tech from Palm Pilots to tablets I think I might just become completely paperless thanks to the iPad. ← Microsoft, Nokia, Facebook, Skype. The teaming of tech companies makes the future look bright! Great goal. I’m glad you found a stylus that works for you. Going paperless must be tough. I always fear buying something like the iPad — only to have the next latest and greatest version available a month later. Are there any good websites you can recommend that allow me to track the “new releases”? Good post — you’ve opened my eyes! Really glad this was Freshly Pressed–I’ve been thinking about getting an iPad for school but was worried about the practicality of it. I have a laptop and a desktop, so I won’t be completely computer-less if I do, but this has post has answered some of the questions I had–specifically about note taking :) Thanks for sharing! It took me a while to get use to my iPad, but now I love it. There are a few apps I feel could be improved, namely the WordPress app. It produces text in HTML form and doesn’t allow you to preview the publication. Also, the stats appear on the left hand side of the screen, creating a massive blank space on the screen. Kathleen, I agree and hopefully they will continue to improve. Even the stats option in the app is relatively new so I wonder was it just a temporary thing carried over from the iPhone app configuration rather than writing a completely new app but the more that use it hopefully the better they will make it. I like the Penultimate app as well, though I don’t think I make the most of it. It sounds like you have a better stylus than i. I like mine, but it is a bit spongy at the end, making it difficult to be precise. I use the iPad for more and more tasks all the time, for home and work. It’s a noble idea, but I think it’d be hard to use for a grocery list. I know I’d go to check something off and spill chicken juice or drop a pineapple on it. OK, maybe it’s just me. I’m addicted to my iPad, but haven’t made the move for a stylus yet. Question: can you use it to write email responses, or do you still have to use the touch keyboard? (Do you need to change settings in some way?) That’s my only annoyance right now — typos all over my emails. Congrats on FP, btw. Pithypants, you can send your notes via email, there is a little drop down and you can email your handwritten notes straight off to people. However it doesn’t convert your handwriting to text. At least not this app that I use. There are some that do I believe. I must actually test them out and if I find the name I’ll drop you a reply. I am wondering, how did you write on the iPad? I mean, do you put your palm on the screen? Won’t this screw-up everything and confuse the app? Jesse, the Penultimate app recognizes your palm/wrist and ignores it. So you can rest your hand on it without any problems and write. It sometimes has a little issue with writing very close to the edge of the page but other than that works brilliantly. The other note taking apps like Bamboo paper and NotesPlus that I tried also have the feature built in so writing was quite easy. My experience with Penultimate isn’t as good as your. I have wrist recognition on and yet I still end up with marks etc all over the place. Cavan, thankfully havent had such issue with Penultimate. Every now and then I get a dot here and there but its not an issue. Good article. I’ve thought about getting a stylus for my ipad, but wasn’t certain if they are any good. I think I’ll try the bamboo now. but what about the people of dunder mifflin? And their jobs? What will happen to dwight? thanks for the update! i look forward to going wireless…someday. i love lists. paper lists. they’ll be hard to give up, but i’m on a mission to do so by 2012. I don’t know if I can give up my post-it’s but you sure make it sound easier than I thought it was. I’m not high-tech by any stretch but your explanation was terrific. I love using my iPad to be paperless. The stylus I use is the Boxwave and I find it works just great for my needs. I am a freelance editor and found the app Sign n Send great to open PDF contracts, sign right on the ipad, then email them back to a client. This is better than the traditional printing, scanning, emailing. I also enjoy being able to write all over a manuscript right on the ipad. Sign n send. Thanks for that tip. That is definitely something I can use! Thanks for the feedback on the pen. I will give Bamboo a try!! Great post and I’m glad I saw this on the WordPress theme! I’m always on the lookout for great iPad apps & styli. Personally, I decided to go with the AluPen. http://www.xtand.net/alupen.html. A bit pricey, but really an amazing pen, professionally made, well balanced, great tip, and really very quite usefull all around. I also moved to the Noteshelf app from Penultimate. I found the direct integration with Noteshelf and Evernote the #1 thing that sold me. Plus, you can choose different kinds of papers without having to pay for them like you do in Penultimate. A fellow blogging friend, Bobby Travis, co-editor of 40tech, beat me to the punch and wrote up a review of Noteshelf, http://bit.ly/q8uOqK. You’ll see a funny discourse at the end of the blog about my thoughts on the Alupen. Cheers! Daniel, on the Alupen I tried it in the local Apple resellers (we dont have Apple stores in Ireland!) but the feel wasnt to my liking but thats a pesonal thing. On the Noteshelf app the integration with Evernote sounds very interesting so yes that could be a deal sealer so will definitely give that a whirl and try it out. thanks. is there not an apple store next to american apparel at the Molly Malone statue? :) I enjoyed reading the article although I hang on to my on-paper-handwritten notes being a dancer writing journals. I found that my content changes from handwriting to writing on the computer with a keyboard (to publishing it on my blog), so I’d be interested if you experience the same, some aesthetic changes in writing. I did the same with my iPad 3g. I have been using that device since January not only to avoid carrying a numerous paper documents with me, but as a replacement for my laptop as well. I use the Penultimate application for handwritten notes. I use FlipBoard for news reading. Pages and QuickOffice handle most documents I deal with. I have since cut AT&T off since their 3g service hasn’t been good enough and switch to an Android device with T-Mobile. This, has kept the iPad stuck in my car’s trunk or on my desk at home but the experience has been the same. Everything happens on my tablet. Android for tablets has been an eye opener as well. I thought that I was going to be disappointed and run right back to the iPad but the G-Slate has surprised me with a better browser, actually three better browsers amazingly (the Android browser, Dolphin HD, and Opera Mobile), full navigation and mapping via voice, a MUCH faster data connection, great battery life, excellent switching between applications without closing them, and a really fluid overall experience. Plus, I am able to fully use my company’s website on the G-Slate whereas the iPad gave me numerous error messages. I still really like the iPad, and did more than alright with it for almost six months, and have moved to something with a bit more power. Tablets are definitely the way to go for a mobile user. iPad, G-Slate, Xoom, Galaxy Tab 10.1, or whatever else…there is no reason to think of these devices as simply home-use toys. We were told all this when the PC computers and printers started back in the late 70’s. So much paper will be saved, less trees cut down, etc. That never happened, the computer printed started up using much more paper because people and their businesses decided to save everything. There is another problem with the modern digital world. The equipment crashes, and when it does, you can lose every important address and accounting statement, and everything like that, that you don’t want to save on some bulk Gmail type system not under your control. I’ve seen too many friends and acquaintances in horros when their systems have crashed. I write all such pertinent information down in paper notes books, and don’t ever use a comouter address book, ever, under any condition. QED. Colin, a good backup plan can save a lot of pain with lost information. Also at some stage they have to guess right ;-) I dont think it replaces paper completely just yet for many functions but I do think its capabiliies make a future without paper a true possibility when people really embrace this type of technology. Been using the Bamboo pen and tablet for years – nice to know it’s iPad friendly – iMac and I do so much together, graphics, media etc. Will there be any jealousy if – and when – I get an iPad? I’ve been really wanting an iPad, but I don’t really have an excuse to get one… Maybe for college in a few years? By then, the iPad will probably have some really cool features. I will definitely buy an Ipad as soon as I get afford. Is it difficult to get used to? How fast could I write an e-mail? Any tips? Thanks to you all who shared information about the styluses that you’ve found work well with the iPAD. Are these styluses just for writing, or can they also be used for pecking on the onscreen keypad or selecting a program option, such as in the free iCMTGIS data collection application for the iPAD? I checked out a few of the stylus models mentioned here and found the answer to my question. Yes, such a capacitive stylus will work like your fingertip but will let you point to the virutal keyboard or data entry fields more precisely. Some styluses will work on both the iPAD and the iPhone. For the latter, a much smaller tip would be desirable. LL sorry for delay. As you discovered yes you can use the stylus just like your finger. A smaller tip is not really an option as the devices require a certain amount of touch before they register contact. So getting a stylus with a fine point is not an option but other than that it works really well. Very interesting indeed. Thanks for your thoughts. The one thing that worries me about getting an iPad (or iPhone, etc) is the idea of having the internet with me everywhere. In some ways this is, of course, useful; but it also feels almost invasive. I don’t want to be able to check my email all the time. I think not having access to the internet at times lets me focus on other things, keep perspective on the big picture (instead of nit-picky to-do lists, replying to emails all the time, facebook, etc), and maintain a general lifestyle of independence from the e-world, the (now) old-fashioned way. Do you think having constant internet access has changed things for you, however big or small? Hi, I suppose my job somewhat dictates that I need internet connection as much as possible. I help support a global organisation so with timezones and system problems I might need access even if its only to email at any time. I have had a blackberry for almost 8 years now so I am used to it. As I also use it for keeping up to date via twitter and facebook with the news and family and friends I quite enjoy having the constant internet. There are times you need some quite time and managing this is my problem. Its not the computers or iPads fault if I check email. Its because I have chosen to do so. What I like about the iPad is if I really feel I need to I can turn on airplane mode (you can disable data and wireless on any smartphone or mobile type device now I know). This completely disconnects you from the world while still allowing me to read a book or watch a movie on it. The balance thing with life is what we have to manage and I dont think people should necessary blame these devices if they get that balance wrong. They need ot examine how and when they use them. These wonderful devices should help us and facilitate communication and our work life balance and not become a barrier or a problem in them. Great post! I am glad there are others out there trying to really utilize the iPad as a productivity tool rather than just an expensive reader/game machine. I am writing about the iPad as a productivity machine at tabletproductiv.wordpress.com. 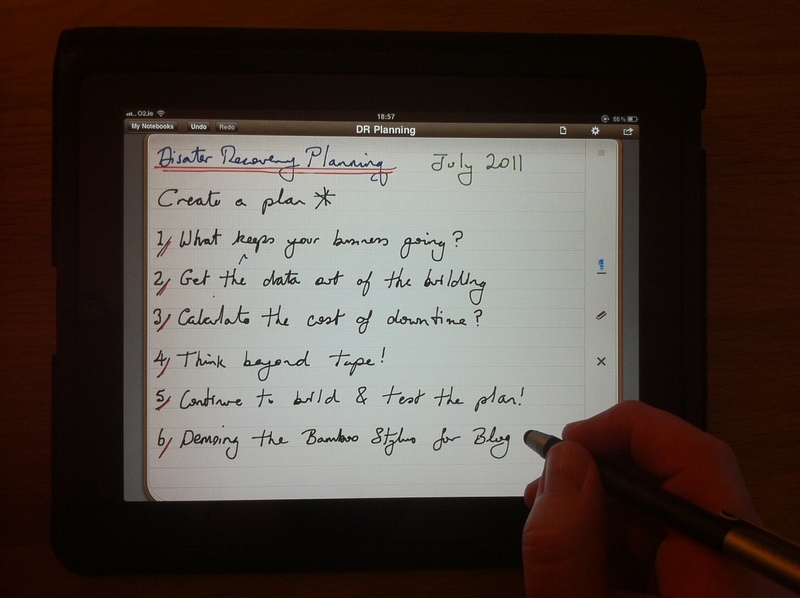 In fact my last post was about the utilizing NoteTakerHD and a stylus to eliminate paper. I hope my next post on Evernote done in the next day or so. Chris, thanks I will and look forward tips I can pick up! Darnit, you may have broken my reason for not wanting to buy an iPad. I’m a playwright and a grad student, and my biggest problem is needing to take notes on scripts during rehearsals. Most recently, I had to do this while shooting a sitcom, balancing my laptop against my stomach. An iPad would have solved the portability issue. The scripts were usually PDFs, but sometimes Word documents. Does GoodReader allow you to make document changes? Great post, technology these days is getting ridiculously cool! aloha Feker – good to know about Bamboo. i’ve had my ip2 for several weeks now. i agree – the pogo is not working out for me the way i’d like. i’m a visual artist. i would use it a lot (i have and the tip mushes down one way too much so that it’s hard to find the point). i also dont like the feel in my hand – it slips too easily, and i can not rotate it the way i like to do when drawing. i’m definitely looking for alternatives. but have not bought yet. barrel length is another issue – and for me a thicker tool would be preferable. i too have and like penultimate – i’d use a stylist with it – but have gone back to finger due to pogo issues. i have several drawing and painting apps i like in different ways. probably the simplest is Zen Brush and i go to it almost always first or to play, to try ideas. it doesnt have everything and it could use a few more options – like more than one go back level – but then with sumie – which is what this app emulates – you dont go back much. i prefer to use an app for what it does tho, rather than what it emulates. i do like the sensitivity in the pressure when i draw. all in all it’s still a great drawing style app with some sense of painting. although i use photoshop elements on a desk top the – now free – photoshop app doesnt do a lot for me. it will tweak a photo. to do more you have to buy additional things. ArtStudio functions in ways more similar to photoshop elements although there is some learning curve to how things are done. it’s reasonable and once i get to know it (i bought it a few days ago) i think i’ll be able to do quite a bit with it as a drawing painting app. Inspire Pro is also reasonable although a little cumbersome to go back and forth on some screens and the Type function is limited but workable. SketchBook Pro is also reasonable and easy to learn. if i do a drawing in Zen Brush and want color i can easily bring the drawing into these other apps through the photos or in other ways. i can not however bring it back into Zen Brush – another feature that might be nice – but i’m okay without it and which is also somewhat characteristic of zen concepts in painting. i’m using the ip2 in a variety of ways similar to you with less focus on them – ebooks, and the web etc. yeah, bottom line – i like the ip2 a lot. i’ll be taking it with me on a short trip soon. i’m curious what i’ll bring in the form of actual paper (drawing and watercolor paper) and sketch pad – things i usually take. i can see how i might be okay just using the ipad. and now i’m wondering if the Bamboo is my solution for a stylus. thanks for the input. aloha. Do you know the SmartNote? It’s very good to make notes at pdfs files and it has a link to dropbox. I like very much its. Hi, I am not familiar with Smartnotes. I tried Scribblenotes, Notesplus and Penultimate and ended up liking Pemultimate the most (even thought Notesplus has a lot more capabilities I liked the pure simplicity of Penultimate). The linking with Dropbox though is interesting as I do use Dropbox so will definitely take a look to see what it can do. Thanks! I just bought my Galaxy Tab (P1000) five days ago and reading this post gave a bit of regret. H’m. Tablet PCs nowadays are really redefining the concept of going paperless. Enjoyed your post! My 10-yr old daughter is a HUGE fan of the ipad and is allowed to bring it to school to write and read from. Yes if I was in charge of the world every kid would have one :-) instead of those heavy bags they have to carry everyday (very first world comment I know!). I have 2 kids and they love the iPad but unfortunately using it in school is not an option yet. I say yet in the hope that in the not too distant future it will replace at the very least the books for reading and lessons even if they still use paper for writing. Very informative. I am using paper, but have altered my habits so that I use much smaller papers – like sticky notes – because I often write very short lists. Wow great, paperless is good. Much better for housekeeping and also viva for a greener environment! Hi Feker – this makes me think my 94-year-young friend could easily use it. I’m going to take her to look at iPads this weekend! Great post! Very informative, having an iPod makes it easier to practice Time Management. This is a great post! I’ve been looking forward to the Bamboo Stylus for my iPad, I’m glad to know it actually works well. Thanks for being so informative. And if you are into iPad stuff, you should definitely check out my blog! I haven’t felt the need for a stylus, yet, but will keep your recommendation of the Bamboo in mind. What I can’t figure out is how I managed to get by for seventy years without my iPad2 and iPhone4. Love ’em. Congrats on being fresh pressed. Do you miss the paper? Sometimes I miss it.. I liked writing, wrote notes every evening to try and keep track of everything. Generally always wrote with a fountain pen as I just loved the flow of it on paper compared to a ball point…. plus there is some definite satisfaction to writing up notes and flipping the pages, and ticking of tasks on paper as compared to on a screen…. but on the whole I prefer the iPad. I love that I am used to the multi tasking and flipping between my hand written notes and sending and email or updating a site or typing a blog…. ust it all in one device is so appealing to me…. I love how useful the Ipad is! As with quite a few of the techy stuff. :) Plus, GoodReader is great! I’m so happy to see a blog with actual writing in it to get freshly pressed. I am so tired of seeing a collage of pictures with no commentary and nothing to read. I wasn’t a fan of the ipad until my boyfriend bought it and he used it at school for all of his notes, recording lectures and typing papers and creating designs (he’s an architect major) it is so versatile and does everything a laptop can do but it easier to take around. Argue this with me if you want to, although papers can be binned accidentally or lost, WHAT IF YOUR iWhatever CRASHES?! To never – ever – ever recover again…..??!! Oh, and can you just put that face down on a photocopier and copy a few disaster recovery plans for your team?? Hmm…….. Sometimes studying IT makes me really doubt it…. I dont have to photocopy it from the app I can just email the page of my hand written notes straight off to people…yes its that esay and we dont need to waste paper … however if you do need it on paper then you can print from within the application so all the team can easily have a copy …. Don’t know why you’d need to photocopy the ipad either. Surely you can just email it to your team or – if you really need to – just print it out. I bought an Amazon Kindle ‘coz I’m an addicted reader, and I like the small mobile book-sized hand-friendly style, and the way the e-ink format can be easily read under most conditions. At the time I wasn’t aware of the capabilities of the iPad (thought it was just another pointless toy! ), but it does so much more, it will replace the laptop if it hasn’t already. I’ll surely get one soon, but not to replace my Kindle, just to be more mobile with my computing. What was that about Worpress? Problems? Great stuff, and keep the info coming. Cheech, thanks. No probelms with WordPress just hope and am sure they will stay developing the app for the iPad. I use both my Kindle and my iPad. The Kindle is much easier on the eyes for reading novels although I do prefer the iPad for non-fiction and reference. Of course, with the Kindle app you can also read all your Kindle books on the iPad. Kindle + iPad? Sounds great! I’ve just re-worked my budget. I happened upon this blog because it was in the freshly pressed on WordPress and i am glad i decided to read it. Ever since i got the iPad 2 i have been asked by many how i like it. It really is much easier than carrying a computer, a bunch of books, and notebooks. My friends have never been more jealous of me. lol I love it. btw, where can i find that pen? I updated to the new Ipad as well. Funnily enough using a stylus has never entered my head. I’ll check in from time to time and see how using the stylus goes. I’ve been paperless for years. Our printer ink dries out before it ever runs out. At least I now fill my own printer cartridges. All the best and hope to see you all over at our blog from time to time. Thanks Feker for your reply. Bless your heart for taking the time to respond to so many comments. Coffee a waste? What a horrible thought!! I inject mine intravenously! Hahaha. I didn’t say coffee is a waste. I still do addicted to coffee ;) But I thought I might keep a balance between coffee and save some money for myself to get me an iPad! Hahaha. Great blog post. I also had that first stylus, and have been looking for a new and improved one. Where did you purchase the Bamboo at? If you don’t mind saying, what was the price? Yes, it is definitely a wonderful and noble way to be paper free. But still ipad has a long way to go as far as complete product development is concerned. But, you post has definitely made me more determined to buy one for myself!! Very cool! I hope your anticipating the release of iphone 5! Nice work on attempting to go paperless. It sounds like you are doing pretty well so far! I try to only use paper when I really have to as well. I am actually just trying to do it with my laptop. I am trying to use Windows sticky notes, notepad, google calendar to cut back on my use of paper. I also try to use my smartphone for directions instead of printing them off. Generally, I really only print/write when I really have to. For example, when traveling via plane, I “think” I have to print off the ticket. Generally though, the iPad, and computers in general should be cutting back on paper usage and saving trees :). I enjoyed reading this post… Great report. Not quite sure if I will ever use a stylus on my iPad2. However, it does look quicker to jot down something rather than typing. I do believe that iPad has revolutionised the ways we do things. The instant on feature and the long battery life are anything but perfect in its way. Apps and games run immediately and it’s not a wonder why people just love to carry it around. Yes, paperless is a trend of current world. I did Fax over IP system before, it’s also a paperless solution ! Thanks for the info I’ll have to try the Bamboo out. I still like idea of writing without having to punch keys which the iPad forces you to do but not like the comfort of a laptop. Are there other apps for writing that you recommend other than Goodreader for writing? The app for writing that I like is Penultimate. Another app I tried and liked was Notes Plus and I know a few that use this and really like it. It seems iPad paperless is a new technology that has much difference with Fax over IP. Great article! It spurred me to look into getting a pen….however, I wasn’t going to spend the $41.00 on one that I wasn’t sure I was going to even like or use. I went with this one http://accessories.us.dell.com/sna/productdetail.aspx?c=us&l=en&cs=19&sku=A4609292&baynote_bnrank=0&baynote_irrank=0&~ck=baynoteSearch by Targus. Best 15 bucks I ever spent! I have tried the Bamboo (a friend of mine has one) and I have to say, no difference between the two. I will stick with my 15.00 pen. Thanks for the write up on this topic! Great job. Great post, please do post more posts. I didn’t realize that you started with a capacitive stylus. Now that you have the Byzero solution, could you ever see yourself going back? It soulds like you really use your iPad to it’s full extent. How do you file and organize things so you can find them again in the future? I want to use mine (when I get it) mainly for business, so I expect to have a lot of business documents, and want to use it to take notes during meetings. I’ve tried bringing my notebook to meeetings, but I don’t think we have moved far enough into the digital age where that is acceptable – I get comments like stop doing your e-mail when all I am trying to do is take digital notes. I think an iPad and hand written notes will save the paper, and not disrupt people as I will be hand writing notes. Out of curiosity – what size (memory) iPad do you use? Does it provide enough space? If you are not already at the 64 GB version, do you wish you had went larger? Or is the iPad efficient with memory usage? No on capacitive pen. Love the Studio i and I wont go back. iPad works great for taking notes at meetings. I do it all the time. I use Evernote to file and organise a lot of notes, docs and web pages (dropbox a little also) as it syncs across my devices and computer. For the handwritten notes I was using Penultimate but now use the studio i app Studio Basic +. In both and most hand writing apps you can have multiple pages and multiple notebooks, back them up and refer back 1 week, 3 months, a year no problem. You can also export them out as pdfs to keep them in other areas. E.g. I wrote up some project management notes with a few diagrams and didnt bother typing up just converted to PDF and then filed in Evernote for reference. I got the 64Gb as I am a heavy user. Not so many apps but I do use it for movies, music and pictures a lot so they eats up the space pretty quick. I’ve got The New iPad on order now, I’m hoping for a speedy delivery to Canada! I too opted for 64GB, as I’m hoping to become a power user, and completely reject paper where possible. I ran into this alternative pen doing some additional searches. It’s by Ten One – the same company that did the Pogo, but this one is pressure sensitive and connects using Bluetooth 4.0 found on The New iPad. The device is code names Blue Tiger… It’s just a sneak peek for now… I wonder how far along they are in development. This pen is very interesting as it does not require a receiver like the Ten One stylus you use. I’ve got Evernote installed on my Blackberry, but have never really used it – I’ll have to explore to prepare for my new tablet. I’m sure I’ll have plenty of questions once I receive my new device! Yes there are a few pressure sensitive stylus on sale or coming to market I beleive. Another I know of is the Jot? and have read about 1 or 2 others inlcuding a brush one for ‘painting’. However these are more suited to art as opposed to writing or fine drawing as they are still capacitive so have a very large head that touches the screen. What I love about the Studio i for writing is the very fine tip like a felt tip pen that allows for much finer print and greater accuracy overall in use.